Though summer is at its peak in most parts of India and literary events almost at a standstill, the coming month will bring cheer to many readers as it will mark the release of some riveting offerings. If a publicist informs you at midnight that you need to leave everything aside and begin reading a novel slated to release in the upcoming month, it surely brings with it a ray of hope —the sublime joy of finding your next read. Shubhangi Swarup is described by seasoned editor and publisher Udayan Mitra as "an extraordinary talent", while poet-novelist Jeet Thayil says her's is "a remarkable debut". Beginning in the depths of the Andaman Sea, and circling through Burma and Nepal to end amidst the highest glaciers and passes of the Karakorams, the story is said to sweep through worlds and times inhabited by unlikely but seemingly convincing characters. Of all novels releasing in the coming month, Swarup's seems to be the most compelling. The author of this upcoming book, a former spymaster of Pakistan's Inter-Services Intelligence (ISI), recently made headlines after he teamed up with RAW's A.S. Dulat in a book of dialogues. Durrani was later summoned by the Pakistan Army to explain his position on views attributed to him in the book. Coming up with a new book in July, Durrani will reflect on his time in office—refined by distance and by diplomatic stints in Germany and Saudi Arabia. His assessment of the challenges faced by Pakistan in the last few decades, according to the publisher, is both novel and informed. Though critical of the country's civil and military leadership—also conceding some of his own flaws—he argues that the real causes of Pakistan's travails differ from what international observers have come to believe. This memoir is the extraordinary story of how one woman, Masih Alinejad, an awe-inspiring journalist and activist from a small village in Iran, overcame enormous adversity to fight for what she truly believed and founded a major movement for women around the world with the simple removal of her hijab. It all started with a single photo, a bold statement on Masih's Facebook page: A woman standing proudly, her face bare, her beautiful, curly hair blowing in the wind. Her crime: Simply removing her veil, or hijab, which is compulsory for women in Iran. It sparked a social-media liberation movement, and across Iran, women started posting pictures of their uncovered hair on Masih's page in open defiance of the strict religious beliefs of their country. But behind the scenes of this movement, Masih has been fighting a painful personal battle. Read The Wind in My Hair to know more. The memoir released in the United States on May 29 and will be hitting the stands here in July. 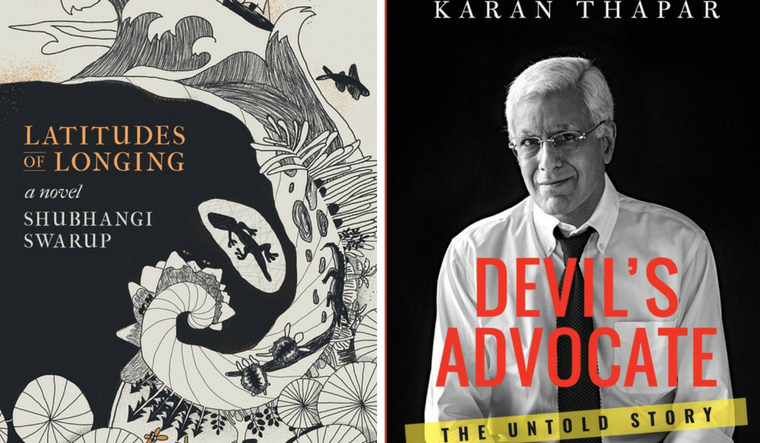 In Devil's Advocate, veteran journalist Karan Thapar dives deep into his life to come up with many intriguing moments. The book will feature stories of lasting friendships and long associations with Benazir Bhutto, Aung San Suu Kyi, Rajiv and Sanjay Gandhi, among others. However, not all friendships lasted; for example, L.K. Advani, with whom he shared a close bond until an unfortunate disagreement over an interview caused a fallout. The tension generated during an interview has spilled over off-screen multiple times, and the author discusses these incidents in detail. The untold story of two of his most controversial interviews—with Jayalalithaa and Narendra Modi—are also elaborated in the book. Riveting and fast-paced, Devil's Advocate is said to be as no-holds-barred as any of Karan Thapar's interviews. The book is scheduled to release on July 20. In this book David Devadas, a former political editor at Business Standard, focuses on the rise of militancy in Kashmir. The book also explores the roots of the angst among Kashmiri youth, which exploded after the killing of Burhan Wani. He relates the increase in the generation of rage in Kashmir to the inability of those in power to declare the end of militancy at the right time. Exploring vital aspects of the conflict economy, murders for rewards, and terror acts by state-backed mercenaries, Devadas shows how simplistic black-and-white narratives suit both pro- and anti-state actors equally and lead the poor and marginal to their deaths.